We publish books, both fiction and nonfiction, that people want to read, books that beckon you to take them from the shelf and start reading. We are a small independent publisher based in the Appalachian foothills region of South Carolina. We are not a vanity press, subsidy publisher or so-called self-publisher meaning our authors do not pay us anything at all to have their books published. Instead we pay all costs of publishing and distribution and pay our authors royalties based on sales of their books. Moonshine Cove Publishing's only form of income is book sales, not payments from authors for book design and production. Our books, both print books and eBooks, are distributed nationally and internationally through Ingram and many regional wholesalers. They may be purchased online at Amazon and Barnes and Noble as well as in most bookstores. If you don't see a particular book you're hunting, ask for it by name. Wholesale copies can be purchased on our website. Many of our eBooks are available in just about all eBook formats including Kindle, Nook and ePub. From its founding in 2011, Moonshine Cove has always strived to produce quality books. Now this effort is being recognized. WHAT WENT WRONG WITH OSCAR TOLL by Charles Bush has been chosen as the BEST LEGAL THRILLER 2015 in the annual NATIONAL INDIE EXCELLENCE BOOK AWARDS. 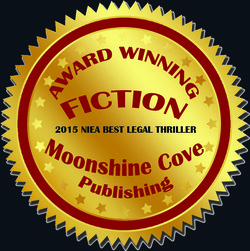 Moonshine Cove Publishing — AWARD WINNING FICTION. Finally, after such a long struggle, the letter or email you've waited for so long arrives. A publisher is offering you a contract. The burst of excitement passes through you like an electric shock. Unfortunately in far too many cases, the idyllic relationship you hoped for with your publisher sours. You become just one more gear in a vast business machine. Your emails go unanswered, or if they are answered, it takes several days. Your ideas for the cover design are not wanted. The slant of the promotional copy does not fit what your had in mind. You have lost control of your book. Just wanted to take a second to thank you for the in-depth and invaluable critique you sent. Last night, I really took the time to absorb it. That is the most worth while writing tutelage I ever received. It is much appreciated. Now I can see why, although I thought my stories were superb, the unwitting writing blunders I were committing set me back. I will review your suggestions before putting pen to paper each time I write. I can' wait to begin fixing up the new manuscript I'm working on with your suggestions. "Compared to my last publisher, the entire Moonshine experience has been wonderful. You've been great; the editorial process was really helpful; the cover is better than I could have ever imagined. High praise from me to the entire staff there! Thanks for all your hard work.--Dan Lawton, author of Plum Springs. "I really liked the format of the book - the size and especially the feel of it. So many people have commented on the velvety feel of the cover, and I'm sure that many have bought it having been enticed by that and the very professional appearance of the book."—F. Colin Duerden, author of BLOODWATER. "If I may, I have been most satisfied with and impressed by Moonshine Cove. It's been a pleasure working with you, Gene. Thank you for those editorial suggestions." -- John Vance, author of ECHOES OF NOVEMBER. "...thank you for EVERYTHING. You were an amazing mentor and I love Moonshine Cove Publishing and all that you represent. You work hard to give writers access to publication and you do it because you love it." --Macy May Marcus, author of RANT OF A RETAILER. "...I am totally happy with Moonshine Cove Publishing and with you, Gene, for being so accessible and encouraging. I am so glad I picked you to send my manuscript to. How many authors can say their book was published in ten months from the time it was accepted."--R. C. Durkee, author of ​RUM RUN. Do you have a goal for your book? That's an easy question to answer--you want it to become a best seller and get made into a big hit movie, of course. You may have another goal too—win the lottery! Both are great goals and both have about the same chance of happening: roughly the same chance an ice cube has with a blow torch flame. Now that we've got that out of the way, what realistic goals do you have for your book? This is something you should spend some time thinking about before you start querying. Will you settle for nothing less than a big press run and a quarter of a million dollar publicity campaign? Then you need a literary agent, preferably one of the famous ones, the kind that have famous clients. Wouldn't it be great if you had the same agent as Stephen King? Sure it would. There are several ways you can get an agent like that: 1. You are famous; 2. You have a million followers who read your blog; 3. You write for a magazine, ezine or newspaper with a huge circulation; 4. You appear on national television every few days; 5. You are filthy rich. If none of these are true, you can try lesser known literary agents. What's that? You say say you've already tried four hundred different agents and got nowhere? That's no surprise. It can be harder to get an agent than a publisher. No, really, that's true. Do some research and you'll see. With agents, maybe 1 query out of one hundred is successful. Your chances are about ten time better at Moonshine Cove. We typically offer contracts to about ten authors out of a hundred queries. But maybe you know all of this already. Maybe that's why you are considering sending a query to Moonshine Cove instead of Random House or Simon & Schuster. Wait—that's right. The big publishers only accept queries from literary agents? Why? Because they can. Before you decide to query us, make sure you will be happy with us if we offer you a contract. We don't have any huge press runs; as a matter of fact, we don't have press runs at all. Our books are printed when an order is received. Neat, simple, highly efficient. No warehouses stacked with books that can't be sold. No waste, no returns, no going out of print—that's what print on demand technology offers. POD is the wave of the future. The dirty little secret of the big publishers is that they are using this technology too, for their lesser known authors, the ones with names you probably wouldn't recognize. That's actually most authors. We also don't have any huge budget for publicity. In fact, we make it clear to each and every Moonshine Cove Author that they will have to shoulder most of the responsibility for promoting their book. Most of your sales will be through Amazon instead of book stores. The reason is that, although book stores can order our books, they are unlikely to stock them because we do not accept returns. The exception to this would be independent deals that an author might work out with a store. As we hope this section demonstrates, we are also honest with authors, no sales talk, no spin, no rose colored glasses. Author Anne R. Rachin signing a copy of her book, All That's Familiar, at a recent book signing event in a Barnes & Noble store located in Bellingham, MA. The book shows that growing old need not signal the end of one's productivity. It provides a road map for how we can achieve this hopeful goal for our loved ones. Query first (email only). Put either Query (Novel) or Query (Non-fiction) in the subject line. Paste in the first five pages after your letter. Don't include any attachments because we will not open them. LIST AT THE TOP OF YOUR QUERY THE AUTHOR'S NAME, TITLE, WORD COUNT AND GENRE. Make sure your query is the best writing you can do since it may be the only sample we ever see. Don't try to be fancy. Direct and to-the-point is better. In your second paragraph, tell us what your book is about and why it's worth publishing. Convince us it's worth our time looking at more. Your third paragraph gives you a chance to tell us about yourself including your writing background, published work and how you plan to promote and publicize your book. If you are a published author, be sure to mention that. List each book, its genre and how well it has sold. NOTE: If you paid the publisher any amount of money to publisher your manuscript, you are not a published author. PLEASE DO NOT CALL YOURSELF A PUBLISHED AUTHOR IF YOU MEAN AMERICAN STAR BOOKS, FORMERLY PUBLISH AMERICA, OR NUMEROUS OTHER SIMILAR COMPANIES THAT MAKE THEIR PROFITS FROM SELLING AUTHORS RATHER THAN BOOKS. PLEASE NOTE: WE PUBLISH ONLY WORK THAT HAS NOT BEEN PUBLISHED BEFORE. IF YOUR WORK HAS BEEN PUBLISHED IN ANY FORM, E-BOOK, VANITY PRESS, SUBSIDY PRESS, SELF-PUBLISHED, PLEASE DO NOT SEND US A QUERY. YOU WILL BE WASTING YOUR TIME AND OURS. WE ALSO DO NOT PUBLISH POETRY, FANTASY OR NOVELS SHORTER THAN 40,000 WORDS, SO THE SAME APPLIES. We only publish work that is original and that has not been published before. If we ask to see more, we will let you know. If we ask (and only if we ask), first and foremost, don't send us anything that hasn't been edited. Make sure your work is error free, clear and concise. Send us exactly what we ask for, not more, not less. We try to make a decision on whether we want to pursue your work further within six weeks to two months from the time we receive your query. If you haven't heard from us within two months, you should contact us again because sometimes we miss seeing query letters that our spam filter caught. Do not send us anything by regular mail, electronic submission only. Submit your query to this email address: publisher@moonshinecovepublishing.com. Do not send us anything except a query letter with the first five pages of your manuscript PASTED into the body of the email (pasted, not attached). We will not open attachments or click on embedded links. If we ask to see your manuscript, send it only if it's your final edit. If you're still thinking of making changes, it's not ready to send, so please don't send it. Our decision will be based only on that version of the manuscript, not another one that you want to send later. We will accept no changes or no later version of the manuscript until we move to the editing stage. What Genres are you Interested In Seeing? Novels - adventure, action, historical (especially ancient Rome & Greece), historical romance, mainstream, mystery, romantic suspense, hard science fiction (not fantasy), police, political, suspense, thriller, true crime, legal, psychological and anything else that strikes our fancy. Non-fiction - economics, history, military, nature, political, psychology, science, self-publishing, writing and others. How Do We Evaluate Query Letters? * Is the author's name, title of work, word count and genre listed at the top of the query? Failure to do this might be an indication that the author has trouble following directions. Because we work closely with our authors, we see this as possibly meaning the author might be difficult to work with. So before we even get to the query, we've already formed a negative opinion. Don't start out with one strike already gone. * We go next to the first five pages of the work. That's right! Without reading a word of the query, we get right to your writing sample and we rate it on a scale from one to four. Failure of your first five pages to capture our attention results in rejection, without even having read your query. The same result follows if your writing sample has grammatical errors. Queries that don't include the first five pages are rejected. If your five pages are borderline, we go to the next step, reading your query. Is it well written and grammatically correct? Does the author present a specific promotion plan for the proposed book? (Not a bunch of generalizations such as "I'll use Facebook to promote the book." Tell us how you will use Facebook and how many people are going to see what your write at Facebook.) We also check Amazon to see if you're a published author? As explained above, that does not mean Publisher America, Tate or one of the many other vanity presses. Certainly we're open to first-time authors and have published quite a few of them, but being a published author is a plus. If we find one or more of your books at Amazon, we check to see how it's selling. Obviously, the better it's selling, the greater are your chances that we'll want to see your manuscript. For novels - do the characters sound intriguing? Does the plot sound original and interesting? Do it sound like something that we would enjoy reading? For Non-fiction - is the subject one that interests us? Does the author have the expertise to write such a book? How big a platform does the author have? We do not require you to follow the formatting shown below; doing so, however, creates a good impression and makes our reading of your manuscript go smoother. NOTE - None of this applies to the five pages you paste into your email query. We realize your careful formatting gets pitched out the window in email. * Your manuscript must be in Word format, either docx, doc or rtf. * Use any 12 point font that is clearly legible. * Do not include headers or footers except for page numbers. * Do not use tabs or the space bar to form paragraph indents; instead, use Word's automatic indenting feature. Set it at 0.2 inch. * Use italics where appropriate; do not underline. * Use a single space after each sentence, not double. * DO NOT add an extra space between paragraphs (good for letters, not manuscripts). * Indicate scene or time breaks by typing and centering *** . * Don't indent the first paragraph after a scene break or at the beginning of a new chapter. * Please do not use special formatting in your document. Set font and style to normal. What if We Turn you Down? Does Moonshine Cove Charge to Publish My Manuscript? NO, NO, NO. Moonshine Cove Publishing is a small independent press, but NOT a vanity or so-called subsidy press. What that means is that you do not pay us to publish your book. We are selective and we publish only what we like. If we do contract with you to publish your book, you will never have to pay us a cent. Instead we will PAY YOU a royalty based on the number of copies your book sells. Our royalty rate is based on a sliding scale that is higher than many publishers. The exact terms are spelled out in detail in our standard publishing contract. Be careful when you shop around your manuscript. Companies that charge you money to publish your book don't like to come right out and say that. If their presentation is slick enough, you many think they're not charging you anything until you get into the fine print of the contract. If you do decide to pay a publisher, shop around for the best deal because their charges vary tremendously, from as little as a few hundred dollars to more than ten thousand. How can Moonshine Cove publish your manuscript for free? Because as mentioned above, we are selective. Unlike Vanity Presses who will publish just about anything, we are really careful about what we choose to publish. In fact, approximately 90% of the queries we receive are rejected. What if we Offer to Publish Your Manuscript? In the words of the old song, "Don't worry, Be happy." Read carefully our publishing contract. We have recently simplified it by taking out the legalese (those Latin words law schools teach their students to write to justify the high fees they charge after passing the bar exam). Make sure you understand what each paragraph means. If there's something you're not sure of, ask us. We'll get right back to you with an answer. If you do become a Moonshine Cove author, we will carefully edit your manuscript and write a complete critique of the work, typically several pages long of single-spaced text. You will be expected to go through the manuscript implementing the suggestions in the critique. This work will typically start about a month before the scheduled publication date, which will be no longer than a year from the date on the contract. Please note that our edit and critique will be based on the original version of the manuscript that you sent us at our request from reading your writing sample and query. This is the version on which we based our decision to publish your work. It is supposed to be the FINAL VERSION, fully edited and polished. After you sign our publishing agreement, you should stop all work on the manuscript until you receive our edited version and written critique. Finish work on another manuscript or start planning another one. When the time comes, this will allow you to look at your previous work with fresh eyes. You may be surprised at what you see. If you've ever shopped around for a free lance editor to produce a written critique, then you know such work doesn't come cheap. You can easily pay $3,000 for what we provide for free. Why do we do it? One reason only. We want you to become the best writer that you can be and we want our books to be a quality product. We strive to produce books we both can be proud of. How Many Copies of My Book will be Sold? No one can answer that, but in all likelihood, not many. That's the reality of the publishing industry today. The number of sales, however, depends greatly on the author, particularly how much time the author is willing to devote to publicizing and marketing her or his book. The more effort the author puts into this, the more copies of the book will be sold. All such marketing efforts will be at the author's own expense. Moonshine Cove spends money to publish your book and to make it available nationally and internationally, but does not have funds for marketing. We do make available to our authors suggestions of how to go about this, but we are unable to do it for you. Writing the book is only half the battle, less than half the battle. If you want it to sell, you, the author, must publicize and promote your book at your own expense. If you are not willing to do that, Moonshine Cove is not the right publisher for you.